The Qualcomm Institute (QI) at UC San Diego and the San Diego Art Institute (SDAI) announced the formation of a new alliance that will fuse cutting-edge technology and contemporary art in the heart of Balboa Park. A memorandum of understanding signed by the two institutes will create future opportunities for students to display their work at SDAI and collaborate with artists and QI researchers to create new and original pieces that use, challenge and showcase the capabilities of cutting-edge technology, such as immersive virtual reality. The announced alliance will offer unprecedented new opportunities to the next generation of San Diego artists by introducing students from several local community colleges to advanced technologies and connecting them with peers and faculty at UC San Diego in disciplines that might not normally intersect with the art world. In the near future, these unique student and faculty collaborations will be showcased — both the art and the technology — to the large audiences drawn to SDAI and Balboa Park. QI researchers will also have the opportunity to test and apply new technologies in an engaging arts space setting, potentially leading to breakthroughs in exciting areas of research, such as human-computer interactions. The convergence of cutting-edge technology and contemporary art will begin on November 30, 2018 during the opening reception of SDAI’s next show, Rising Tide (which runs through January 6th). This cutting-edge, multi-media exhibition will feature three distinct solo shows, including an interactive visual and sound installation by San Diego-based artist and graduate student in computer music, Jacob Sundstrom. 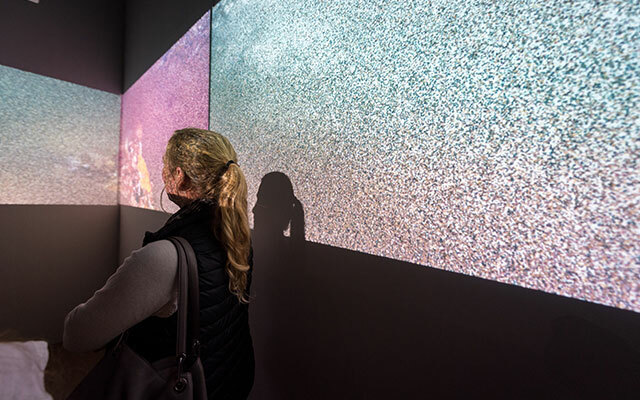 Sundstrom’s immersive visual and sonic installation Erasure will exemplify the types of engaging and tech-enhanced experiences to be presented at SDAI via this long-term partnership. In an effort to enhance the way visitors experience SDAI, new technologies will be thoughtfully integrated into exhibits in a way that will better connect the viewer with the artwork. The partnership will also position SDAI as a pioneer for world-class innovation, bringing cutting-edge technology from QI to be uniquely experienced in Balboa Park. Museums across the world are actively engaged in technological innovation — from the use of virtual reality to the exploration of real and fictionalized worlds. Such innovation creates space for artists and scientists to work collaboratively to explore and push boundaries of perception, understanding and possibility. The Qualcomm Institute at UC San Diego is home to unique technology and tools, such as large-scale video walls, spatialized audio systems and immersive 3D virtual reality environments. In some cases, these facilities — and the expertise to develop and use them — do not exist anywhere else in San Diego. SDAI advocates and provides a platform for artists, exhibits world-class regional contemporary art and fosters cultural equity. As the only contemporary arts institution housed in Balboa Park, SDAI serves as the premiere catalyst for high-caliber regional contemporary art and artists in San Diego and allows the artistic visions and voices of our region to be seen, heard and celebrated.